The high definition (HD) mode increases the vertical resolution of the R&S®RTE (standard since serial number 300.000) and R&S®RTO oscilloscopes to up to 16-bit. Waveforms are sharper and show signal details that would otherwise be masked by noise. Users benefit from even more precise analysis results. The high definition mode increases the vertical resolution up to 16-bit. This is required to analyze signal details on a signal with high amplitude variations. One example is the characterization of switched-mode power supplies. Here you need to measure smallest signal elements on a several hundred volt signal. A resolution higher than 8-bit is a must for precise measurements in such situations. The HD mode increases the vertical resolution of the R&S®RTO and R&S®RTE oscilloscopes to up to 16-bit. To achieve this higher resolution, the signal is lowpass filtered after the A/D converter. The hardware-implemented filter reduces the noise in realtime, thereby increasing the signal-to-noise ratio without any reduction of the update rate. The high definition mode offers advantages over high-resolution decimation. You know exactly what signal bandwidth is available due to explicit lowpass filtering, and there are no unexpected aliasing effects. Since the HD mode is not based on decimation, the increase in resolution is not accompanied by a reduction in the sampling rate. When the HD mode is on, the full sampling rate is available, ensuring the best time resolution. The increased resolution in high definition mode makes it possible to reveal even the smallest signal details. The unique R&S digital trigger design allows you to trigger on signals with increased resolution. Each of the up to 16-bit samples is checked against the trigger condition and can initiate a trigger. This means that R&S®RTE and R&S®RTO oscilloscopes are able to trigger on even the smallest signal amplitudes and isolate relevant signal events. Switching on high definition mode does not compromise measurement speed or functions. 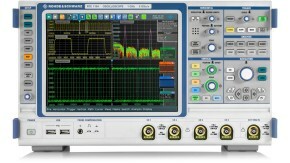 Since the lowpass filtering, which improves resolution and noise suppression, is implemented in realtime in the oscilloscope’s ASIC, acquisition and processing rates remain high. 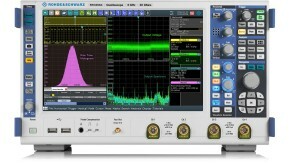 The oscilloscope enables smooth operation, and measurement results are available quickly. You can use all analysis tools in high definition mode, including automatic measurements and FFT. The R&S®RTE and R&S®RTO oscilloscopes can measure currents down to 100 uA.